I love nothing better than receiving an ‘experience’ for Christmas. To know that someone else has thought about me and chosen a gift that gives me enjoyment is amazing! Even better, there’s no dusting of ornaments or month’s worth of toiletries to use up! 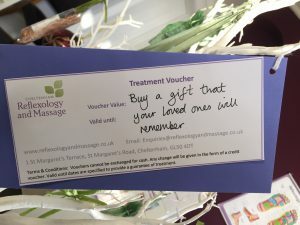 At Cheltenham Reflexology and Massage we offer fantastic gift vouchers for Women and Men. Our focus is well-being and Relaxation, so if you know someone who has been feeling stressed, has discomfort in joints or muscles or just needs some time out, a gift voucher can be ideal for them.